Involvement in Hope’s Missions Team is available to all of our members and we are constantly looking for new persons to become involved in this vital Gospel-centered facet of our congregation’s ministry. The Missions Team meets as needed to discuss the financial and spiritual needs of the missionaries we presently have relationships with, to consider new missionaries for support, and to prayerfully seek the Lord’s provision and protection on their behalf. Our Missions Team also invites missionaries to speak at our Sunday school and morning worship services, and regularly shares table fellowship with our visiting missionaries. 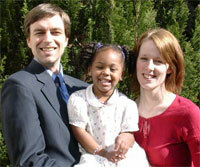 Bergmarks, David and Stacy: (MTW Missionaries to Sweden): David grew up in Skelleftea, Sweden. He came to the United States for a semester of high school. The dry spiritual climate in Sweden led him to return to the States to grow in grace. He majored in Christian Philosophy at Belhaven College in Jackson, MS. David was actively involved in RUF at Belhaven and the youth ministry at First Presbyterian Church in Jackson. David went on to receive his seminary education at Reformed Theological Seminary in Jackson. While in the U.S., David and several Swedish students began praying consistently for Sweden. It was during this time that David began to sense God’s will for him to be a missionary. His heart is drawn to his home country, where less than 4% of the population attend church. Stacy was raised in Atlanta, Georgia. After being saved at a young age, she has continually grown in the Lord. Stacy has always been actively involved in the church and started contemplating world missions as a result of numerous short missions trips, as well as a year mission trip to Russia. Pecks, Andy and Sue (Wycliffe Bible Translators): Andy and Sue Peck have served Wycliffe since 1987, first at the JAARS Center in North Carolina and then over nine years in Peru. Andy specializes in computer support, helping translators and administrators use computers in the task of Bible translation. They are now in Orlando, Florida, for the educational needs of their children and working at the Wycliffe office. Andy will be managing the programming department as the administrative software is updated. Sue is an accountant and will continue with special project reporting and finance as she did in Peru. Reformation Hope: Reformation Hope’s mission is bringing Christ-centered transformation, opportunity, and hope to the people of Haiti and the Dominican Republic in fulfillment of Christ’s Great Commission. They do this by partnering with the believers of Haiti to evangelize the lost, disciple God’s people, plant churches, train pastors, assist with healthcare and business development, and nurture the next generation—who will be the kingdom change agents of Haiti. Smiths, Robert and Jeanne (MTW): The Smiths are church planting in Latvia. Sneeds: The Sneeds have devoted themselves to missionary work in the Eastern Mediterranean. As such, their actual names and other details about their mission are not made public in order to help insure that they are allowed to continue serving in-country there. Stocks: The Stocks serve in Southeast Asia. The details of their ministry are not made public to insure they might still continue to serve in that region.